Thoughts and prayers out to our friend David G.
Here are updates from his and Lisa's postings on Facebook. Good Morning Everyone!!! Seems that I'm finally getting past things, and on to recovery. Yesterday was the 1st day that I actually had some real energy, and finally started feeling a lot better... I would have posted sooner, but didn't want to jinx things... LOL!! 1st off, I have to say, THANK YOU SO MUCH!!! to all of you who have had me in your thoughts and prayers... those of you who have commented on this group page as well as my profile page, those of you who have e-mailed, called or texted, as well as those of you who had sent me flowers, plants, & cards. I do apologize to those who did call & text over the last several days and either did not reach me, or didn't get a text response (I will be getting back to you... I promise). I had very very little access to my phone & laptop... In fact, it was Lisa, who would read me each of your comments and posts every night... and with each reading, the smile on my face only got bigger and bigger and the feeling of love & happiness filled my entire body. It was so overwhelming to know that I had so many wonderful, wonderful friends & family who were out there thinking of me, and keeping up with my progress. It's because of all of you, and your prayers to the Good Lord, that my recovery is coming along much greater than I thought it woud be at this stage... in fact, last night, was the 1st time I got to sit in my studio and noodle around on my guitars for a bit... something I didn't expect to do for at least a couple more weeks. Getting around is still a bit difficult, as standing and sitting can cause extreme soreness... coughing can be unbearable at times, and the nausea had been keeping me down. Nighttimes were probably my worst times, and something I would dread facing at the end of each day. Thank you ALL for being mine & Lisa's support foundation... without it, things would have been so much harder to get through... and to my beautiful wife, I cannot thank you enough babe... you have now seen me at my most vulnerable, weakest moments, yet you remain strong & positive for the both of us, and somehow find a way to allow me to find no shame or humility in the helpless state that I've come to know... and that's something only true love can bring. ~David G. from his FB post. Dave got to go home today!!!! The oncologist came in Monday to talk to us and introduce herself. After we were done talking to her we went for a walk; she caught us and said she had just got the pathology report back and if we wanted she could go over it with us. We did. She told us that Dave is at Stage IIIB. The tumor had infiltrated three layers of the colon wall, into the muscular layer, but had not gone all the way through. The surgeon removed 30 lymph nodes, and of those 30 there were 4 that were positive for the cancer. So, because of the lymph node involvement, he is stage III; because there were 4 involved it puts him at IIIB. The treatment is the same regardless of if he was at stage II or III. In the next few weeks we will talk to the oncologist more and Dave will have a port surgically implanted and he will start chemotherapy. For now, that is about all we really know. The outlook is really good for complete recovery, that is what we are praying for. So, that is the news for now. I'll continue to keep everyone posted as we know more. Quick update: First day at home isn't going as well as we'd hoped. Dave is really nauseated and is back to clear liquids. He is still doing ok, except for this horrid nausea. He just doesn't feel like doing anything at all right now. He hasn't been up to looking at his phone or the computer - so if you've messaged him he isn't ignoring you, he just doesn't feel well today. Wednesday. When I started Texas Online Radio back in 2005, my best way to find music was to scour the hundreds of websites out there touting new or regional artists. 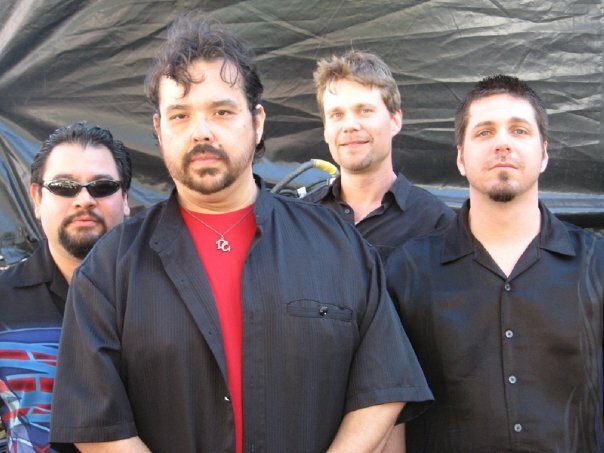 I happened to find the Download.com website and ran across David Gallegos. I listened and was amazed at the guitar work from this Dallas artist. I dropped David an email and told him of my interest. We "talked" via email several times, and when I received his CD "Mas Recuerdos" in the mail, I was hooked. With each song, you feel each note, and you're convinced this is one of the premier guitarists around that deserves a bigger stage and more listeners. it becomes a very sought after item. Just a thought. 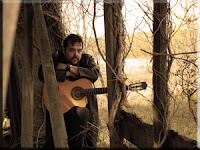 Geared towards stage and theater, private and corporate parties, wine bars, bistros, and upscale restaurants as relaxing background ambiance, the music of David Gallegos is an all acoustic, instrumental latin new age / nuevo flamenco style. 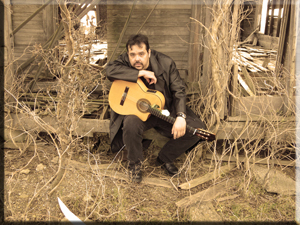 Performing a mix of originals from his CD, "Mis Recuerdos" as well as covers of artists in the same genre, David and his band perform with extreme passion and emotion. 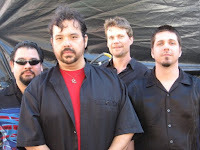 The band has been together and performing since late 2005, but between each musician, everyone has had many years of experience performing in various styles of bands. 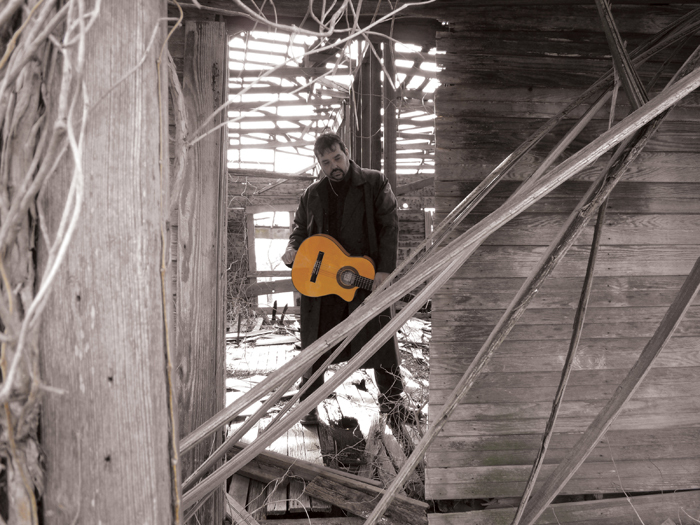 David, having picked up the guitar at the age of 13, has been playing well over 23 years now. Originally playing rock and metal for the greater portion of his career, David eventually began listening to and writing music with a softer, more emotional touch. 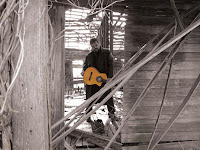 In 2003, he decided to branch off from the progressive metal writing with his band, Power of Omens, and begin work on his first full-length latin new age CD. Already a 12 year veteran to the music industry, with 2 internationally released CDs, contribution to a Queensryche tribute CD, and as a guest artist on one of Sony Recording Tejano Artists, Eddie Gonzales' CD, David took his experience and decided to write, record, design, and release his CD completely on his own. After a year of hard work, the CD, 'Mis Recuerdos' was finally self-released in the Fall / Winter of 2004. ...read more here. included him in the format here at Texas Online Radio. ReverbNation click here...show dates and release information.